So…Bloom Day, right? Then where are the flowers? Thanks to the relatively cool temperatures we’ve had over the last month, they’re taking their sweet time showing up. That’s not to say there aren’t any, just not many. Seed-grown cowslips (Primula veris)–part of my ongoing effort to get more spring color–finally flowering for the first time. 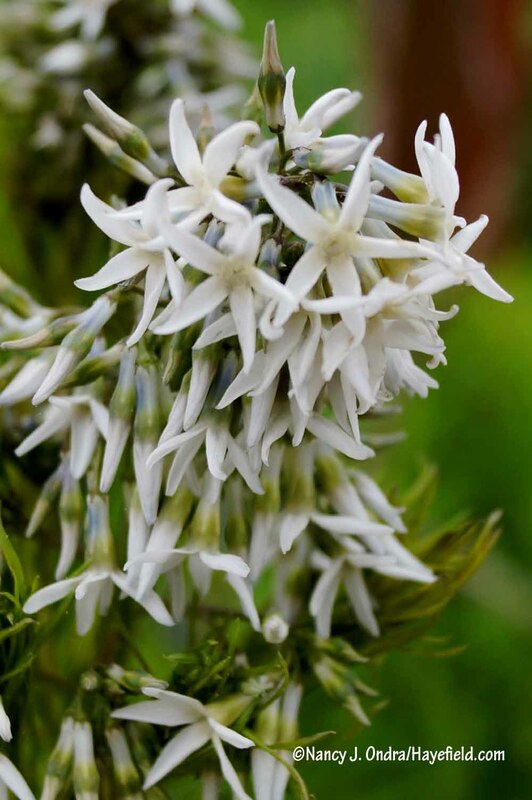 It’s surprising that we haven’t yet seen cultivars of Arkansas bluestar (Amsonia hubrichtii) in the trade. 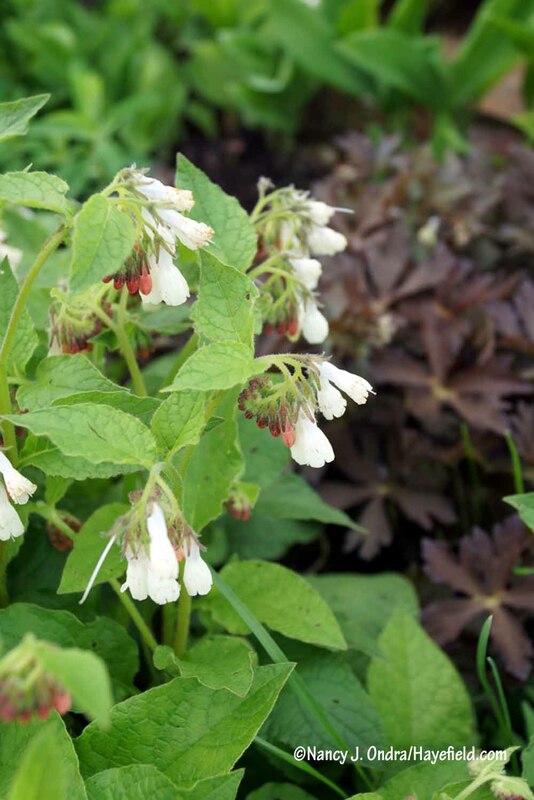 It’s not uncommon to find near-white ones like this among the self-sown seedlings here, and I’m sure they appear elsewhere. The sight of this is almost enough to make me feel I’ve reached the pinnacle of success as a gardener. I have been attempting to grow gas plant (Dictamnus albus) for decades. I tried plants, and I tried seeds, and most disappeared after a year or two. This one I grew from seed started so long ago that the date has worn off the label. But here it is, finally, in bloom. Ahhh. 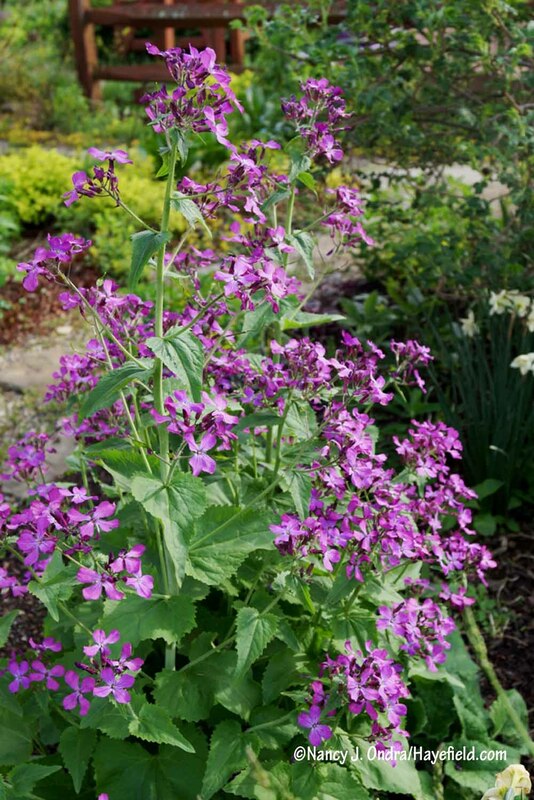 When I last grew ‘Pennies in Bronze’ honesty (Lunaria annua), I liked the darker purple flowers but wasn’t overly impressed with the plant in general. 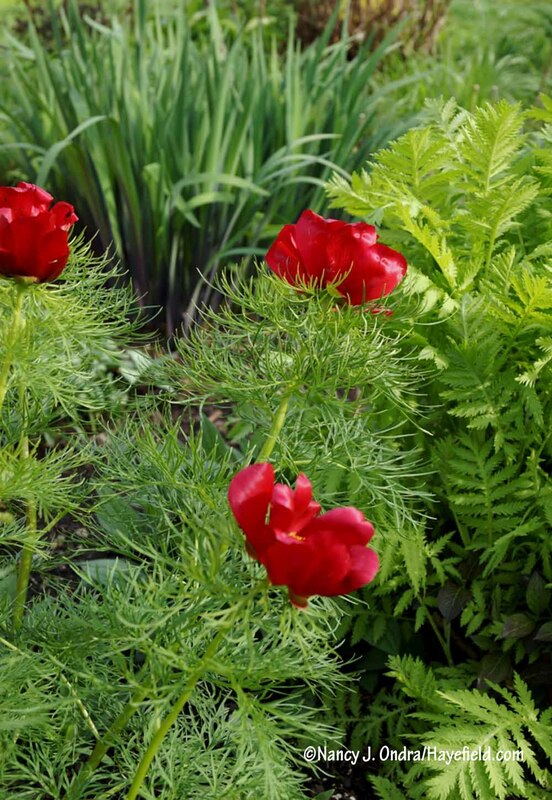 I had the same feeling this spring, when some of its self-sown offspring reached flowering size. But yum, look at the seedpods of ‘Pennies in Bronze’ honesty this year. I don’t recall them being this dark last time. Maybe it’s because it has been so cool the past two weeks. Whatever the reason, I will definitely aim to keep the strain going here. Hmmm…that wasn’t a bad showing of blooms, actually. But it’s the fresh foliage that really shines this time of year. ‘Tiramisu’ heuchera keeps getting better every year! Only last week, we were dipping to just above freezing at night and didn’t even make it out of the 40s all day Saturday. The greenhouse was pretty packed, but it’s emptier now, due to a flurry of planting-out before Saturday’s soaking rain. Hey, there’s a floor again! Getting the scented geraniums planted out in the front foundation border freed up even more greenhouse space. I scored quite a few new selections this spring, so there are over two dozen kinds in here, along with some miscellaneous annuals. Now that the ground is well soaked, I’m looking forward to see what the garden will do when it gets into the upper 80s this coming week. I’m sure the plants will enjoy the warm weather more than I will. The most exciting action of the past few weeks has been the change I hinted at last month. 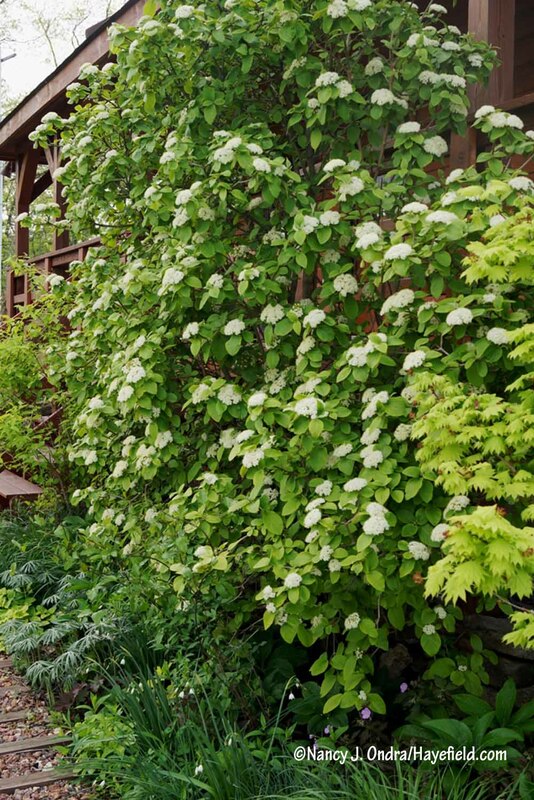 You see, all of my wooden fences and trellises–and arbors–are all about 15 years old now, and they’re all starting to crumble at the same time. The two big cedar arbors in the courtyard are the first to go, I suppose because they’ve been covered with vines much of that time. This one is about to keel over, but I’m hoping it stays up long enough for the clematis to finish flowering. The other arbor was getting unsafe, so I took it down last month. Finding arbors to replace these has been a challenge so far. As a temporary solution, I decided to move the two metal arbors from the side garden over here. They’re not wide enough to fill the spaces, though, so I salvaged two panels from the arbor that was previously here. I still have some straightening and painting to do, but it’ll have to serve the purpose until I find a permanent replacement. As so often happens, this single project set off a chain of others.Though I couldn’t find new arbors I liked for the courtyard, I did find a style and color I thought would work in the now arbor-less side garden. 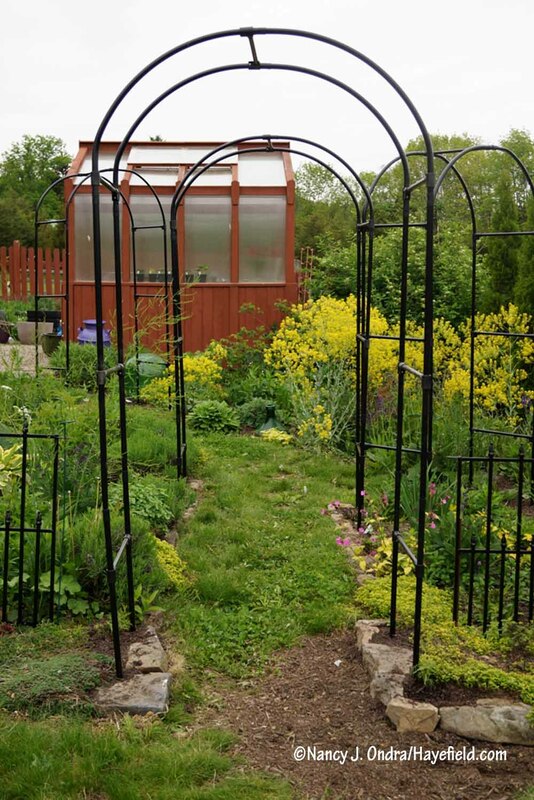 And thanks to a great sale, quantity discounts, and free shipping, I was able to treat myself to six new arbors to create a tunnel-like effect over the path from the side door to the side gate. And then there was a thank-you coupon, and the sale was still on, so I couldn’t resist getting some of these black metal arbors as well. Putting them together was easy; driving their feet 15 inches deep without hitting rocks was not. They’re not grand, obviously, but really not bad for $30 each. And if half of the vines grow, the arbors will hardly be visible anyway. 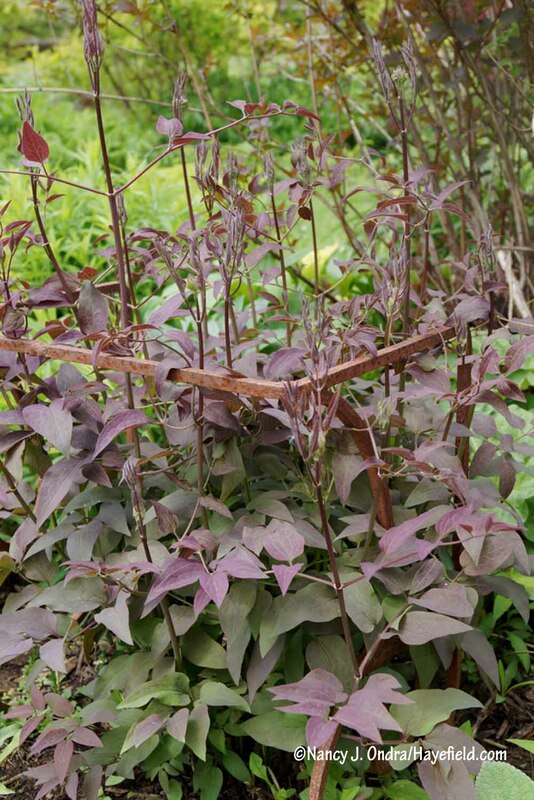 I found quite a few clematis seedlings in the side garden, so most of the arbors have at least one of those, but it’ll be years yet until they are flowering size. For now, it’ll be various morning glories, moon vine, hyacinth beans, ‘Sunset’ runner beans, and some other experiments. The last big project for this spring is turning this mess into a respectable-looking vegetable garden. 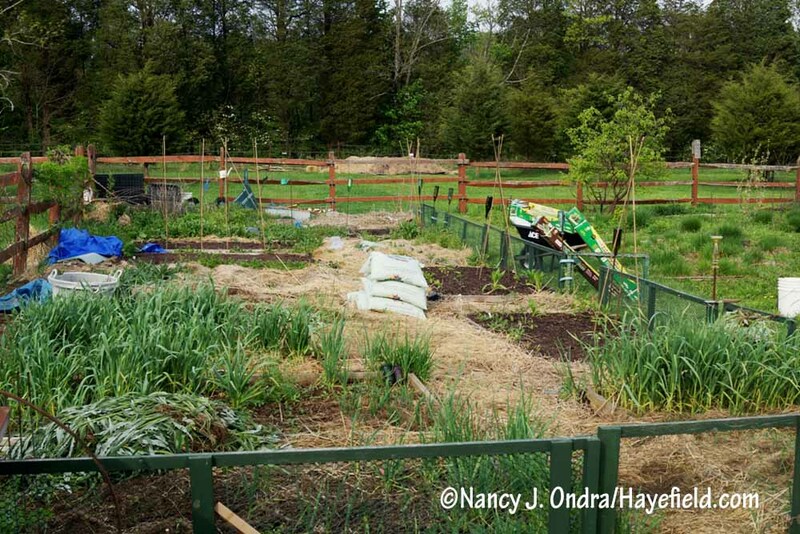 The garlic is thriving, but notice the large heap of Canada thistles in the lower left. Trying to keep ahead of those is a constant battle. But this year, I’m determined to spend a lot of time tending to the edibles. We’ll see if I manage to follow through on this nearly yearly resolution. In the meantime, I’ll wish you all a very happy May Bloom Day. And don’t forget to visit the main Bloom Day post at May Dreams Gardens. As you can guess from the name, it’s a very special time of year there! I’ve been looking forward to this month’s post because your garden is such a beautiful place to visit. My enjoyment of your post this morning was interrupted by the sound of an angry European Hornet that decided to fly into my house at 5 am! I guess he wanted to see your garden as well! Now that he has been returned to his proper place outside, I have finished my walk through your garden. I am excited about your new Eupatorium ‘Pink Frost.’ I have one and am still trying to find some good companions for it. It’s growing in front of one of those Black Diamond crape myrtles, which will give a nice contrast, but I still need to find something to plant at it’s base. I’ll be watching to see what you pair with yours. 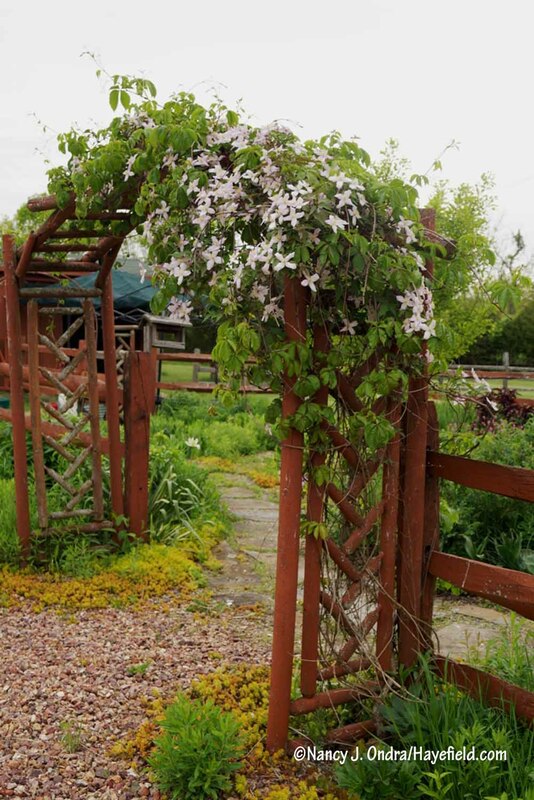 Your arbor project reminds me that I have no climbing plants in my garden. 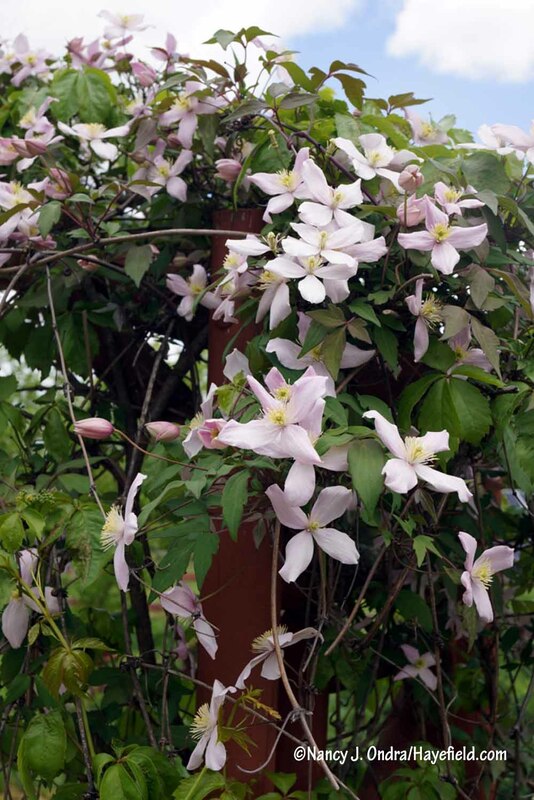 I need to find spots for some beautiful clematis . Your generous gift of Silene ‘Ray’s Golden Campion’ seed from 2015 has given me much enjoyment as I watched it blooming the past month or more. I plan to spread it’s seeds to more areas of my garden. I got much pleasure and great pictures last summer of the celosia you shared as well. I look forward to more combinations as it mingles in new areas this year. Thanks for all of your hard work opening up your garden to us each month. Yikes–what a way to start your day, Debbie. Good to hear that all is well now. I’m looking forward to seeing how the ‘Pink Frost’ does this year. It’s in a sort of holding area this year, until I see if it wants to stay and how it looks as the growing season progresses. Then I’ll think about some partners for it. It’s a joy to hear that the seeds did well for you. The campion is very happy to self-sow if you let it (assuming you have both male and female plants, so the females can make seed). 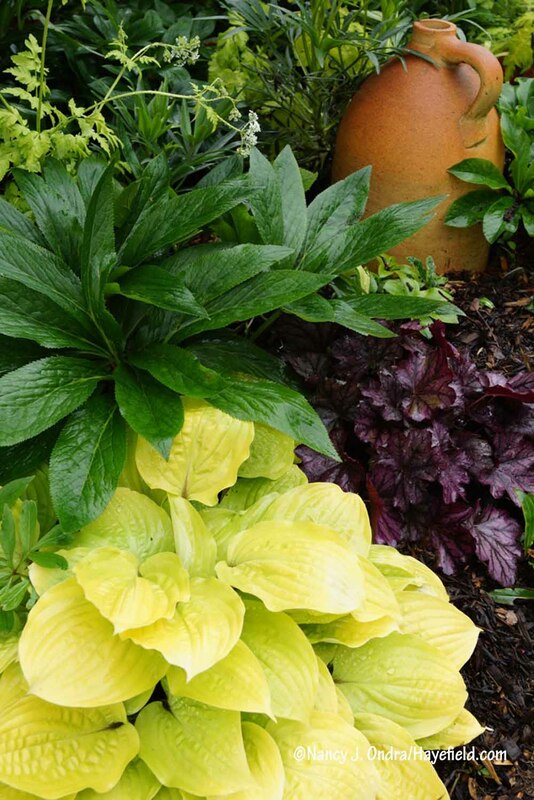 You may want to pull out the green-leaved seedlings, because they are much more vigorous and can crowd out the yellow ones. May you fully enjoy what’s left of spring, and the start of summer! Looking at your post there seems to be no shortage of blooms. I shall look forward to June when you will have even more to post”! Thank you so much for visiting today, Steve. I suspect we both will have many lovely things to share for June. Happy Bloom Day! Wow, I just found this site. I am an obsessive plant maniac too. I am located not that far from you in central NJ. I do not have any formal training, but I have been messing around with plants for quite some time. I live on a half acre, and am situated on the edge of a woods that is owned by Somerset County Parks. I started to plant things back in 1996 here in Bridgewater. I had a very upsetting time that lasted forever, and basically everything went to weeds. That awful period started about 2005 and ended in 2014. So starting in the spring of 2015, I started over again. The sections of garden that I have done over are starting to look really good. I have more to go. It’s pretty physically intensive because I have nothing but shale. You dig a hole and fill up a gallon pot with shale rocks. If I could figure out how to send you pictures, I would send you some. You would like them because you seem to be in love with nature just like me. Welcome, Edana! It’s a pleasure to meet you. You certainly have a lot of challenges to contend with, but when there’s the will to make a garden, it will happen. Have you ever considered starting a blog of your own? It’s an enjoyable way to keep track of your garden projects and plants, and you’ll meet lots of lovely people as well! Thank You for the Welcome. One of the things I find challenging is learning this computer stuff. And the other thing is my eyesight. It is still somewhat off kilter. I had Graves disease for five ugly years and I went into remission in the fall of 2015. As a person moves through the stages of the disease one of the things that happens is you get what they call double vision. I call it more like kaleidoscope vision. It is much much better, but computer screens, mirrors, and TV screens still make me a little crazy. One way I have been keeping track of things is putting everything I do in the notepad in my cell phone. And I take pictures of everything. It puts a date on the photo automatically. My brain would never remember all of the stuff in that phone. The pictures help me to know where my bulbs are after they fade away. I planted an all white edger last fall with white anemone blanda, white Calgary tulips, white daffodils, and muscari white magic. It bloomed this spring and now it has faded. ( it really was pretty) So I inserted some white petunias into it. Hopefully they will fill in somewhat and cover the fading foliage. Still having fun. Looking forward to the summer. Oh my, that’s a lot to deal with. It sounds like you’ve come up with a good record-keeping system for you. Keep up the good work! I always love to visit your garden. Congratulations on your getting your Gas plant to bloom! Love the arbors. I have a cedar and network of branches one I built approximately five years ago and it was torn up and twisted in a serious wind storm. I’ve repaired and reinforced it several times. I can’t let it go. I think my original plan was to train the trumpet vine into a living arbor so once the one I built finally went I would still have some sort of structure. Good morning, Kathy! Thanks for stopping by. Now that you mention it…I have thought that homemade arbors might be the thing for the courtyard, since I can’t find pre-made ones that I like and are within my budget. I certainly have plenty of cedar to harvest. I’m a bit arbored-out at the moment, though. Dictamnus albus! I bow before Thee! Great going, Nan! I sowed over 100 seeds in April… nothing. ). But maybe next year…. That new arbor tunnel is fabulous, Nan! I can’t wait to see it festooned with plants. I’m glad to see that spring is finally off to a good start in your part of the country – I’ve missed your wonderful plants and imaginative combinations. 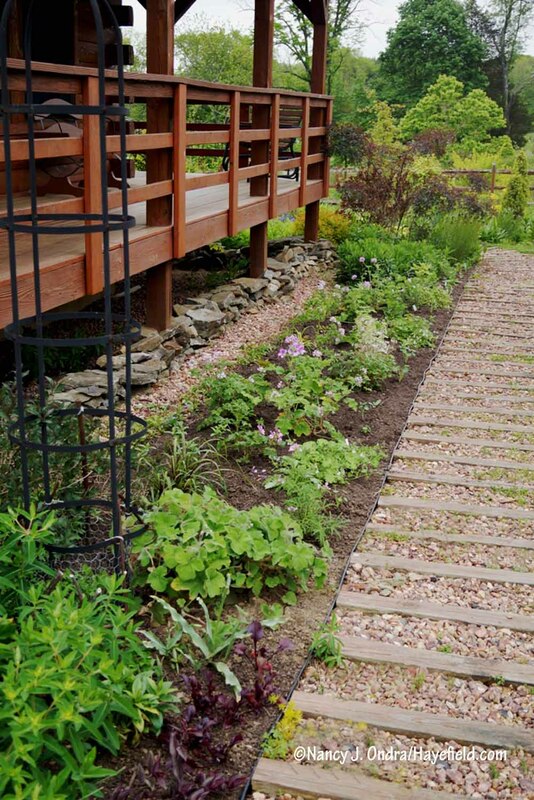 While I can’t grow many of the plants you do (like herbaceous peonies), I always get new ideas from your posts, like a border of scented geraniums, which I can grow here as perennials. Coincidentally, the local Geranium society has a show and sale this coming weekend too! Hi Kris! I bet you could get many wonderful scenteds there. And what a treat you have in store at planting time: Your hands will smell wonderful for hours! Congratulations on your gas plant. Seems like no matter how many challenges we overcome in gardening, there’s always one more looming on the horizon. I keep hunting for arbors that please me. Many are not wide enough, and I am concerned about how long before the metal ones rust and the wooden ones rot. Thus far I am arborless. But for $30 each I would have invested as well. We have a lot of spring bloomers lingering and the lilacs are half open. A heat wave is coming for us as well so I expect all that to change. Too true about the challenges, Kathy. 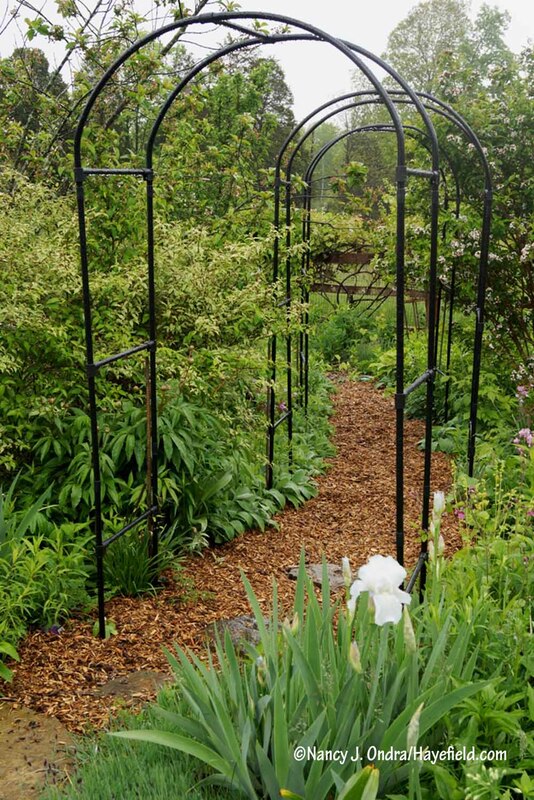 And yes, it’s very difficult to find wide arbors that are reasonably priced. I don’t know how long these metal ones will last, but they were certainly cheaper, easier to assemble, and easier to install than wood ones. 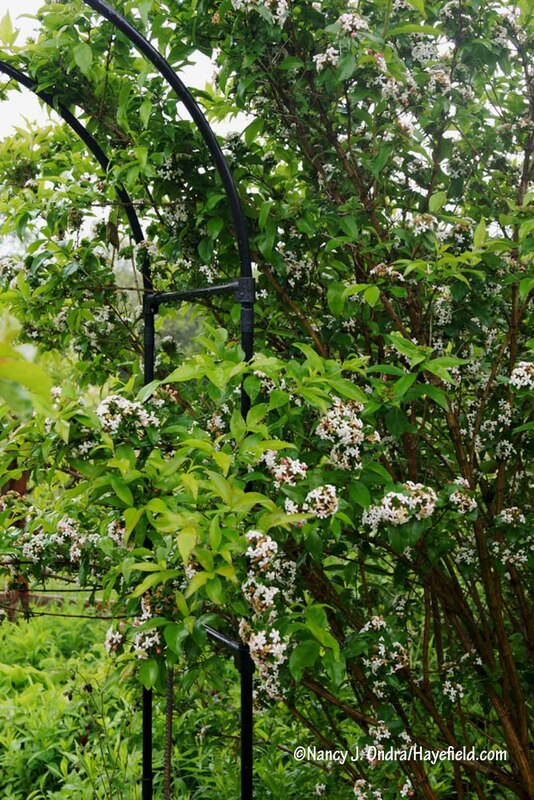 The black arches are still on sale at Hayneedle.com, if you’re interested: Gardman Rose Arch. Happy new arbors to you! Lots of blooms there but foliage is the star at the moment in both of our gardens. A greenhouse with a visible floor? That’s just crazy talk. Hey there, Peter; thanks for stopping by! Yeah, the empty floor didn’t last long; now the cotton plants are getting nice and toasty in there. Happy day-after-Bloom Day, Holly. I miss being able to consider climbing roses as an option; rose rosette disease has taken most of my roses so there’s no point in planting more. I wish you the best with your Sally Holmes. I’m sure she’ll be a beauty and grace your garden for many years to come. Some serious work in progress going on! As always, such a pleasure to view your plant combinations. Thank you for saying that, Linda, and for visiting. Happy late spring! Another beautiful and informative post to enjoy! I inherited two large gas plants – one pink and one white – from my husband’s grandmother. 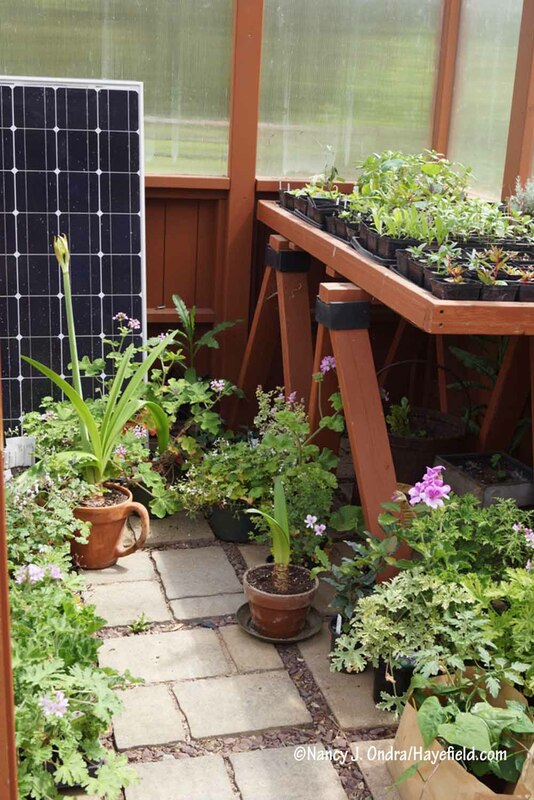 The plants must have been at least 25 years old when she gifted them to me – she had moved them with her several times over the years…..from the family farm to their new home built on the farm, to her cottage at the retirement village. Our family has really enjoyed them over the years – the kids always love to hold a flame at the base of each blooming stem on calm spring evenings and watch the gas light up! I occasionally find seedlings, which I pamper and protect. Both mother plants are beautiful right now, and I love the lemon scented foilage. That’s a wonderful story, Carolyn; thanks! I hope mine lasts as long as yours have. 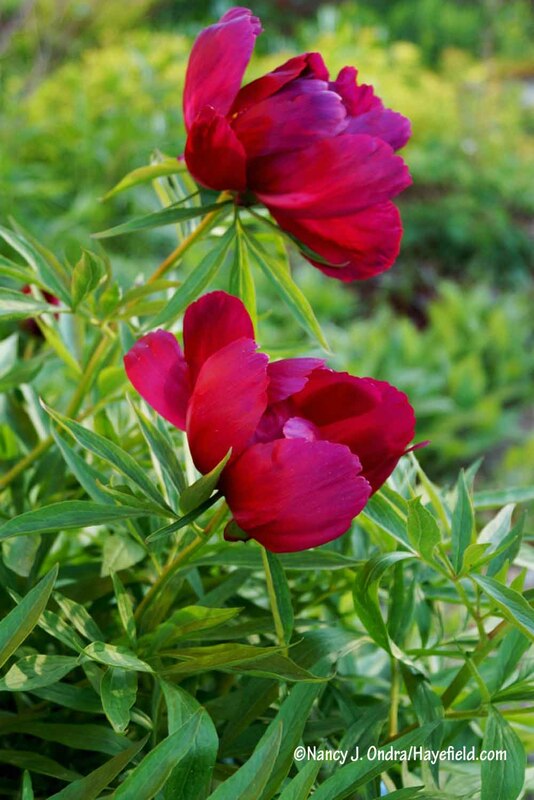 Once they’re established enough to start blooming, gas plants are very long-lived as perennials go, I think — up there with the likes of peonies. At Monticello 20-some years ago, big flowering clumps out front dazzled me and went right onto my list, but I gave up after a much more feeble try than yours. Huzzah for this impressive reward for your skill, determination, and patience! 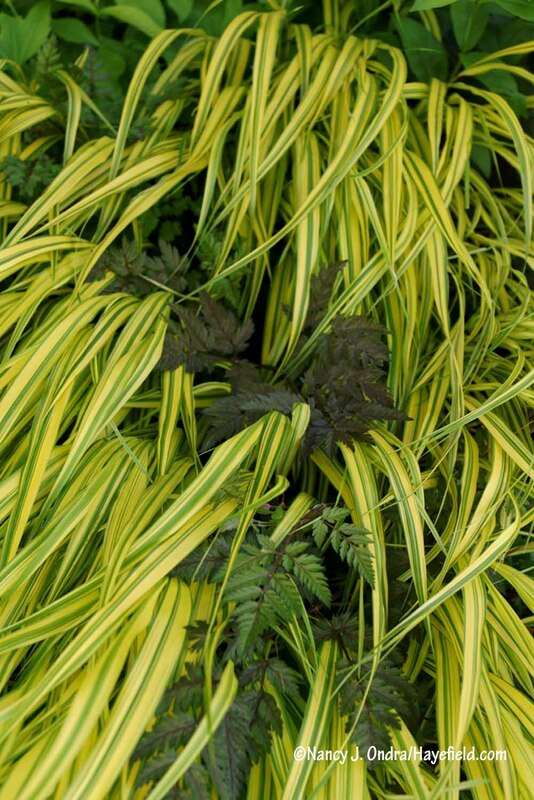 Could look a long time at that image of the Anthriscus ‘Ravenswing’ in the (?part-shade) border. The stems make a wiry echo of the limbed-up tree further along, and at the echoing cream-yellow in the ground layer carries the eye along through the uprights: mmmmmm. The scene here on bloom day was almost a caricature of the old-fashioned spring flower-fest: bearded iris, Siberian iris, peonies, foxgloves, geraniums, species roses. Voluptuous, heavy on pink/white/blue… a look that would get pretty saccharine if it went on much longer than its two-week big splash. Which we’re taking in mostly from inside, because it’s hit 90 for the last three days (moving the sugary show along that much more quickly). When the temperatures break, will have to plant like a maniac. This will be an exciting year in your garden; thanks for all the work that goes into giving us the chance to revel in it! Thanks, Nell! It’s really hot here too, and the dictamnus has produced even more flowers. Sooo…I think I may have a go at lighting them at dark this evening. We’ll see if I really get up the nerve. I don’t want to end up setting the whole thing on fire, after waiting this long, and with the hope of enjoying the plant for many years to come. I really liked that ‘Ravenswing’ shot too. 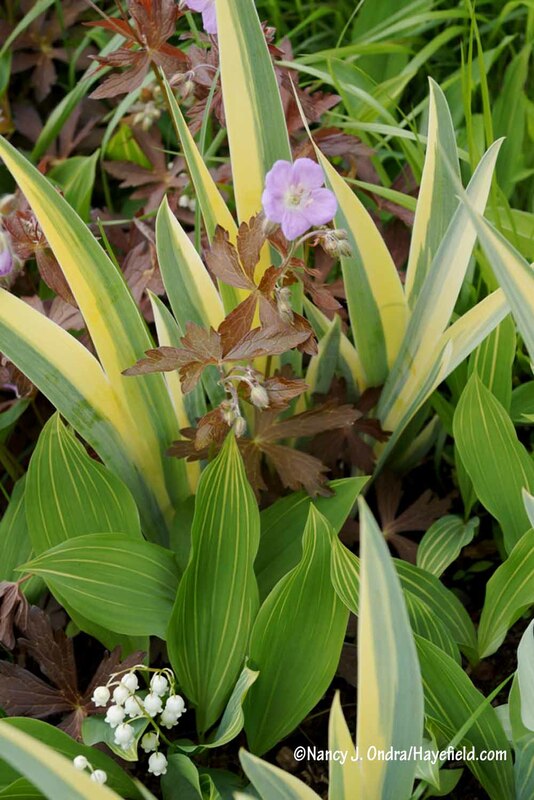 Some of the foreground plants are ‘Variegated Kwanso’ daylily (Hemerocallis fulva), variegated Solomon’s seal (Polygonatum odoratum ‘Variegatum’), and epimediums. That’s my shadiest spot but it still gets full sun from dawn until about 1 pm. Your late-spring extravaganza sounds joyful. The roses and irises just opened here today. We’re supposed to get cool again by the weekend, so I’m hoping they’ll last more than a few days. Good luck with your planting! First time visiting your garden. Wow! It’s wonderful. I am adding you to my list of blogs to follow. Welcome, Leanne! I’m happy to have you as a reader. Happy almost-summer to you! I can’t believe you can grow primulas. They dry up here so fast it isn’t funny. I just love them though. If I had a greenhouse I would surely grow them. I like your arbor project. $30 is a great price even if they don’t last 15 years. Happy Bloom Day Nan. 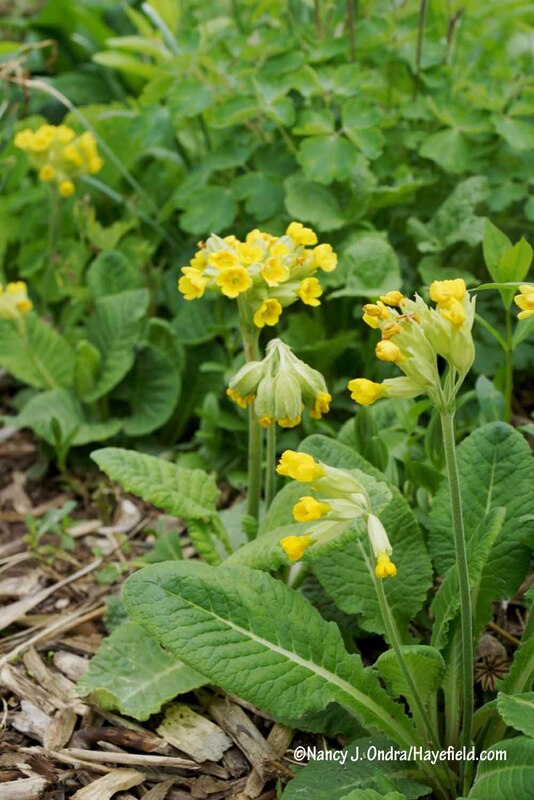 I’ve tried many – they’re pretty easy to grow from seed – but Primula veris is the only one that’s made it to flowering size without pampering (i.e., extra watering). Maybe it would do well for you too. Happy Bloom Day back at you, Lisa! What an amazing garden. I don’t grow many of these plants from seed. I have a very wet garden and friends have shared their primulas with me – and they love the wet. Our garden is new – this is the third summer (but we just had the second spring) and we are still working out our design, especially the very wettest part of our in-town garden. Hi Pat! I really thought primroses would be happy here, as the soil is on the wet side for much of the year. But when it dries in summer, it really dries, and I’m not able to do much watering. I enjoy seeing them thriving in other gardens and wish you continued success with yours! I always look forward to your posts on your garden. Thank your for sharing your garden with all of us.I discovered your gardening blog a couple of years ago. I’ve also read many of your books and am currently reading the Perennial Matchmaker, which is proving very helpful in ideas for putting plants together that compliment each other. I love all the arbors you have put up in your garden and can’t wait to see what you decide to grow on them. I live in southeastern PA too. and like to see what you have growing in your garden to get ideas for mine. I have a small suburban sunny plot and lean towards growing plants for birds, butterflies and bees and am trying to learn more about native plants. I especially love hummingbirds.and plant different kinds of salvias for them. I also have crocosmia Lucifer and honeysuckle vine Major Wheeler for the hummingbirds. I can appreciate your comments about the weather we have been having, It was cool and wet this weekend and in the 50’s and today it is hot and humid and going to 93. I can also sympathize with the canada thistle. I have areas of my garden that have them embedded. I managed to get one area clear (yeah!) and am trying to eradicate the rest by repeatedly cutting them off as soon as they sprout again. Hopefully eventually they will die out! Thank you again for all your posts! Hi there, Christine! It’s so nice to hear from you. Thank you for your kind comments about the books and blog. Yes, isn’t this weather crazy? It’s barely mid-morning and already in the mid 80s. I’m very much looking forward to the return of cooler weather this weekend. The hummingbirds have returned here this week, and I imagine your garden is buzzing with them too. My heartfelt congratulations on prevailing over the thistles in even one area. Defeating them in the veg garden is one of my main goals this year. I love your high summer posts, but this feast of gorgeous fresh new leaves is just as satisfying. The bronzey lunaria is stunning, and I always envy gardens that can grow Clem ‘Serious Black.’ Love the new arbor tunnels too. Kosmic kale must like a good cold snap — mine never seemed to hit its stride. And I didn’t know there was a golden anthriscus! You always introduce me to so many cool plants, thank you! Great to hear from you, Denise! 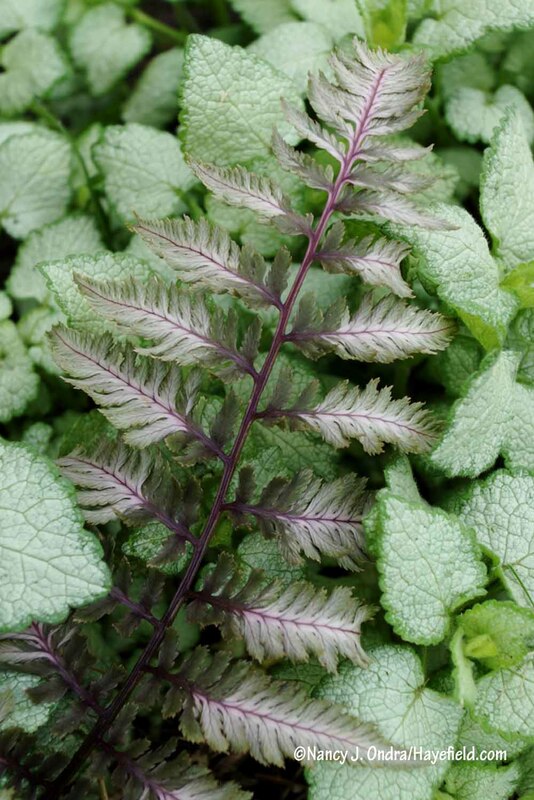 I was thrilled to find ‘Kosmic’ kale again this year and hope it does well. It’s probably not liking our currently sultry weather, though. And I’m so pleased that you appreciated the ‘Golden Fleece’. It came from Plant World Seeds: Anthriscus sylvestris ‘Golden Fleece’. 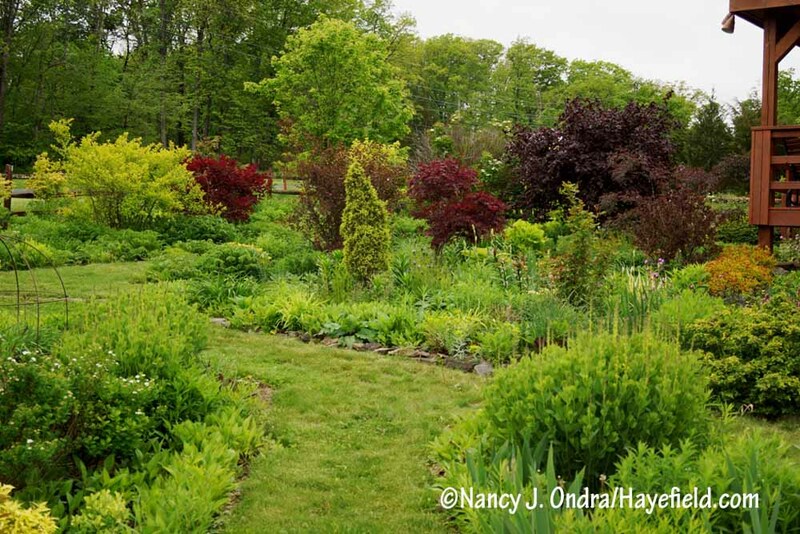 Beautiful garden and blog! I have architectural questions. 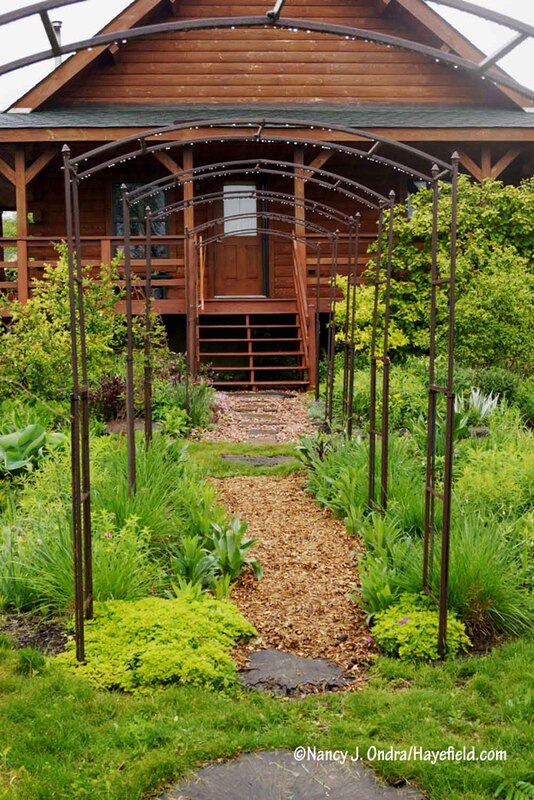 I wondered what type of wood you use for your garden paths – where you alternate what look like 2-3 inch wood beams (?) with stone. I love the idea – but how do you ensure that the wood lasts or are you expecting to replace the wood every decade or so? Secondly, is there a website you prefer for all your arbors? I’m hesitant to purchase such a focal point without seeing the quality and texture of the material first. Thanks for all your advice! Hi there, Ruth. 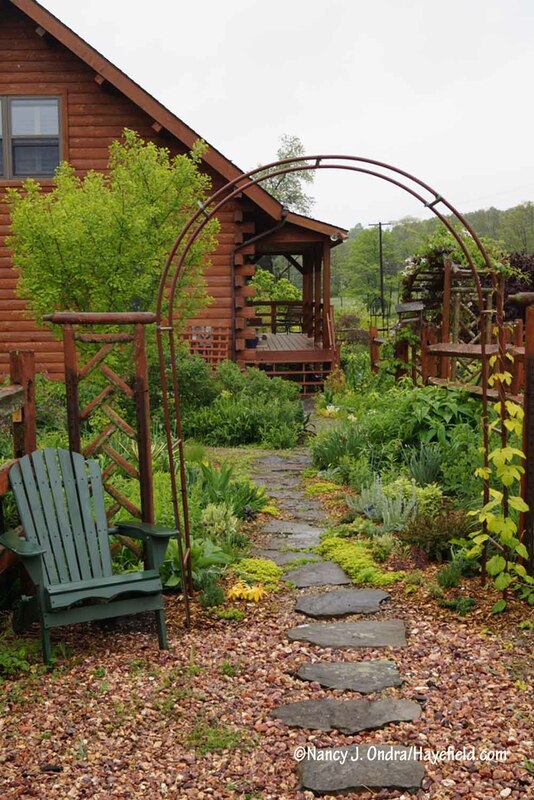 The paths you’re asking about are 4″x4″ landscape timbers alternated with gravel. The timbers have been in for about 15 years now and have held up very well. I’m hoping to get another 3 to 5 years out of them. I’m pretty sure they were some sort of borate-treated wood. Being surrounded by gravel on three sides has probably also helped to keep them from rotting. I bought all of my arbors this year from Hayneedle.com. They had a wide selection and lots of good deals. I’d strongly advise reading the customer reviews before buying, but I will also say that both arbor styles that I bought had some bad reviews (missing parts, etc. ), yet I had no problems with any of the 12 I received. Congratulations on getting the gas plant to bloom! I too have made many unsuccessful attempts at growing one to maturity, and never did find out what it was that I was doing wrong. Perhaps now that I’m in Texas I should try again… Happy June to you! Hi Rob! I didn’t know that you had moved. 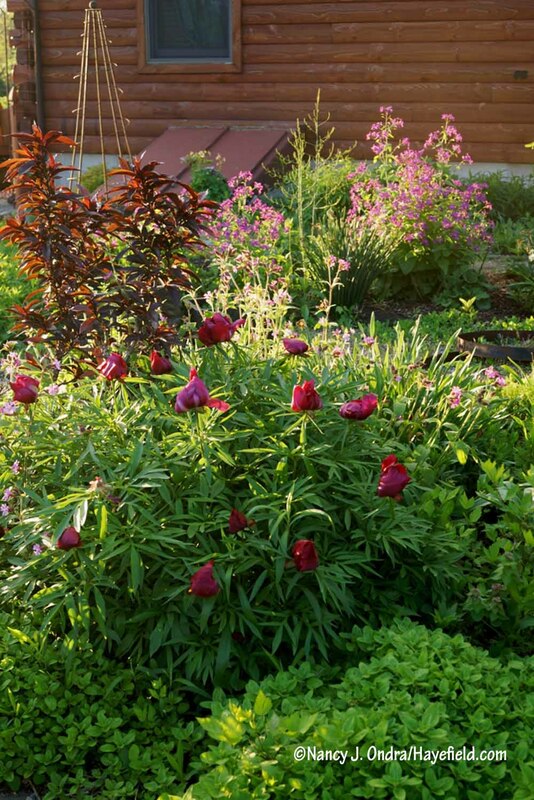 I wish you a wonderful time building a new garden and learning about many new plants!